For soldiers on patrol in Iraq, sniper attacks can seemingly come out of nowhere and leave little chance for return fire. But with new anti-sniper detection systems proving their worth for U.S. soldiers and marines in Iraq since 2004, warriors can now return fire more effectively to defend themselves – and a Montana researcher is independently studying those systems to better understand how they work. The sniper detection systems in use by the U.S. military follow the supersonic trail of a bullet back to the gunman. “If you imagine a slow motion view of this, the bullet is racing ahead and the shockwave expands out like a cone behind the moving bullet,” said Rob Maher, an Associate Professor of Electrical and Computer Engineering at Montana State University. Snipers and gunmen usually use rifles, such as the AK-47 assault rifle and its variants, which fire bullets faster than the speed of sound. 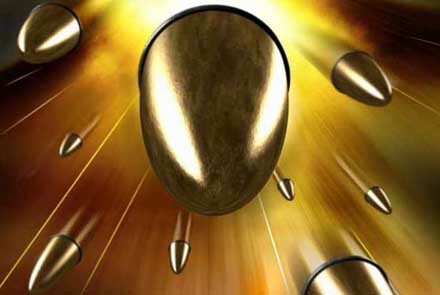 When the gun is fired, the bullet’s supersonic passage creates a shockwave of air particles that are being pushed aside. This is different from the actual muzzle blast of the gun, which produces the sound that people hear as gunshots. “There are commercial systems that have been deployed there [in Iraq] that are able to alert soldiers to where incoming bullets are coming from,” noted Maher. Many of those systems, which are mounted on buildings or vehicles occupied by soldiers, try to pinpoint snipers by detecting both the shockwave of the bullet’s passage and the sound of the gunshot. Maher’s current research involves testing different guns, mostly rifles, which are set up at a firing range. Two or more microphones are organized in a known configuration on the range, and hooked up to a digital audio recorder that records supersonic shockwave. As the gun is fired and the bullet’s shockwave expands outward, a computer program records the different times at which the shockwave arrives at each microphone. Based on the difference in arrival times and other consistent factors, the computer can calculate the angle from which the bullet came. This way Maher can test different guns and bullets by firing them from different angles with respect to the microphones. The process of identifying the location of a fired shot is further compounded when microphones pick up background noise in addition to the bullet shockwave and the sound of the gunshot. Heavy background noises, such as would happen if a sniper fired on a patrol in the middle of a bustling marketplace, are likely to be the case in real-life situations. “The biggest difficulty with any of this is dealing with the natural sound environment,” said Maher. Current computer programs have a hard time distinguishing specific sounds from the background noise, he explained. By contrast, humans are able to listen to competing sounds and quickly focus on one particular thing, something everyone has done while focusing on one conversation in the middle of a loud party. One system that seems to have been able to overcome this challenge is Boomerang, a system developed by BBN Technologies and the Defense Advanced Research Projects Agency, or DARPA. “For the system to work on the move in an urban setting is incredibly challenging,” said Karen Wood, the DARPA program manager who oversaw development of Boomerang. She explained that the system has to work while mounted on an extremely noisy, moving platform – such as a Humvee – all the while ignoring the outgoing fire of U.S. soldiers and marines. The system also has to deal with other complicating factors in urban environments, such as the sounds of gunshots reflecting off of buildings, cars, and even garbage. “When I first got involved in project, a lot of people were saying that it [reflections of acoustic signatures] was not a solvable problem…but BBN had some very clever engineers and algorithm folk who did solve it,” said Wood. However, Maher noted that the research behind a commercial system such as the Boomerang is “proprietary and done without open publication” by private companies. This means that very little information on the commercial systems is available to university researchers working in the same area. “My assumption is that [system designers] basically make a lot of educated assumptions and guesses on what is likely to be the case [in the field], and if those are valid then the systems probably work quite well,” said Maher. Given the lack of public information available on the systems, part of Maher’s goal is to share his research results with the wider scientific community, allowing private and public researchers to improve their own work on existing acoustic technologies, such as anti-sniper detection systems. Maher only recently became involved in studying gunshots and the acoustics of bullets, after law enforcement officials independently asked him to look into the area. He has since presented his work at the annual meeting of the Institute of Electrical and Electronics Engineers, and is discussing future funding with several possible sources such as the Department of Defense. Maher is also looking beyond anti-sniper detection systems, and sees his current work as crucial for the field of acoustics research. Law enforcement could possibly identify guns based on sound signatures of gunshots in 9-1-1 calls, or the National Parks Service could better monitor park and nature areas by studying trends in animal sounds, such as bird calls. Park services could also screen for the sound of unwanted human activity. Admittedly, acoustics research has a ways to go before computers can accurately pick out the faintest sounds, but Maher pointed out that current anti-sniper detection systems are already putting the ideas to practical use in a way that cannot be underestimated. “If I was a soldier and there was any system that would even give me a glimmer of hope of protecting myself, I would use it,” said Maher. That’s the same attitude Wood, of BBN Technologies, used when she approached the development of Boomerang. After the war started, Rumsfeld approached DARPA and asked for near-term solutions that could be applied to the conflict in Iraq. The former Secretary of Defense was looking for something that didn’t have to be a perfect solution, but was at least better than nothing. Following additional testing and incorporating feedback from soldiers and marines, BBN Technologies has turned out a third version of Boomerang. The company advertises its product as having just one false alarm per 1000 hours of use – good enough for the U.S. military, which already has over 100 units deployed and has ordered an additional 100 units. “We get e-mails all the time from people who say thank you for developing the system,” said Wood. good article. i got all informations required. Can i have any detailed description of title “gun shot direction detection system” which is my dissertation thesis. I want to get more informations about this. Can I have any advanced description of title “gun shot direction detection system”?